Sunrise view from deck areas. Community pool area. Ocean Dunes Recreation Center. 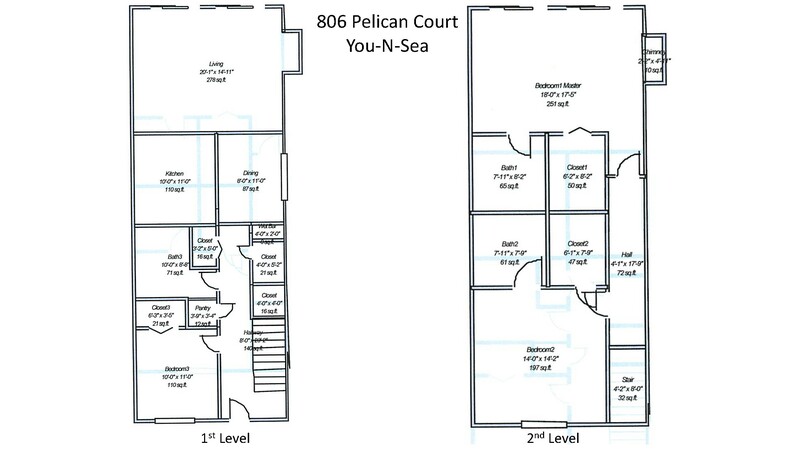 Floor Plan. Deck view. We love our home! We hope you will, too!! Y’all bring your flip-flops and beach towels!! 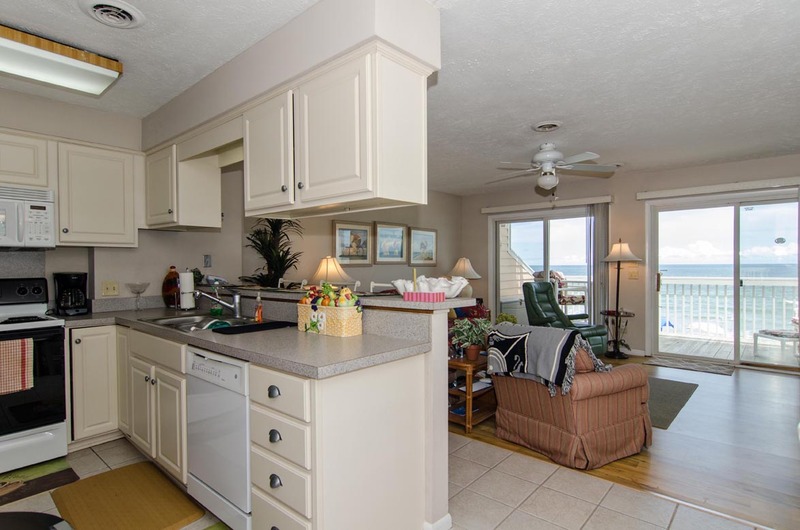 Spacious (1300 sq ft) end unit located in Kure Beach Ocean Dunes Resort; one of largest styles of 3BR, 2-level ocean front condos at Ocean Dunes. With sleeper sofa in family room, the unit accommodates 8 people. 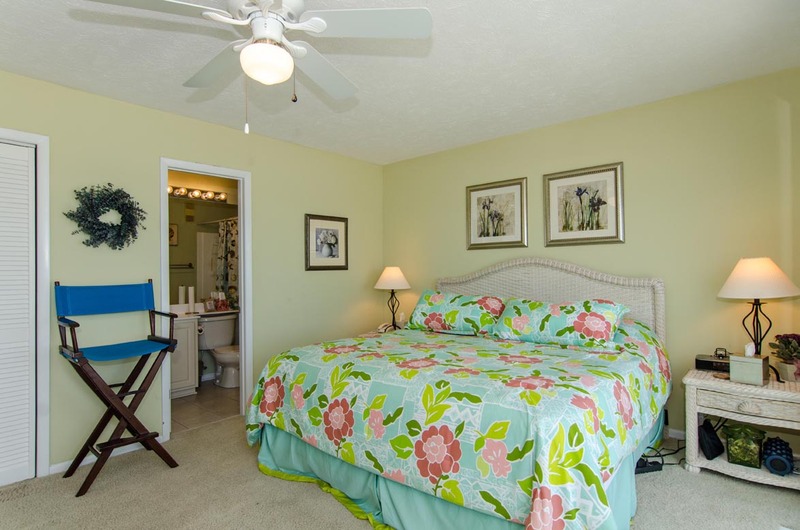 Master bedroom has king bed along with walk in closet; upstairs guest bedroom has queen bed; downstairs guest bedroom has 2 twin beds; living room has sofa bed. 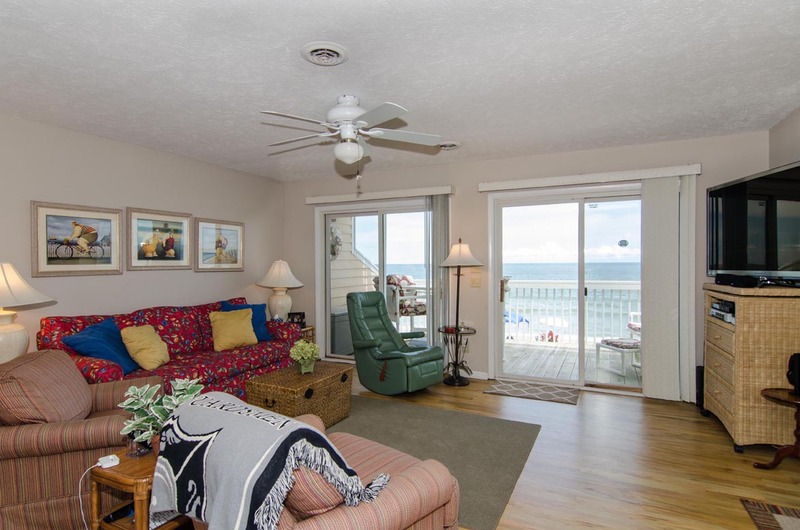 2 Balconies/Decks with beautiful ocean views: 1 off master bedroom & other off family room. Large cooler (not for beach use) on first floor deck for afternoon deck activities. Dining room table seats 6 at bay window; breakfast bar seats 3; lower balcony table seats 4. WiFi Internet Connection. DVD/Blu-Ray Players, HP Laptop computers, Apple TV, HP Printer. Spectrum Cable Premium service with HBO, Cinemax, Showtime. Complete Kitchen (Coffee machine, microwave, cooking utensils, pots/pans, dishes, glasses, flatware, blender, toaster, toaster oven, dutch ovens, small George Foreman grill, cutting board, grater, can opener, wine bottle opener, ice cream scoop, etc.). Beach amenities (beach chairs, beach cart with rollers, sand buckets, etc.). 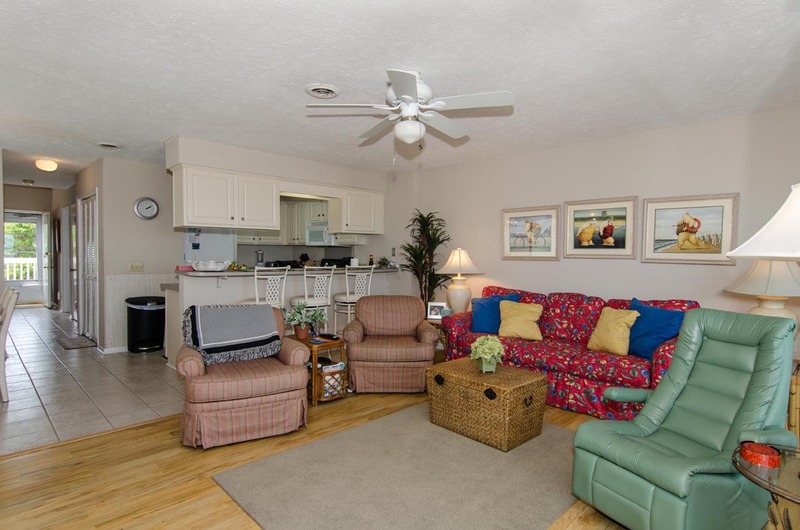 Parking for 2 underneath carport plus one additional in front of unit; Additional Guest Parking available. Storage Bin for Beach Gear in Carport. Wooden Walkway with Gate-Coded Access to beach with outdoor shower adjacent to unit. 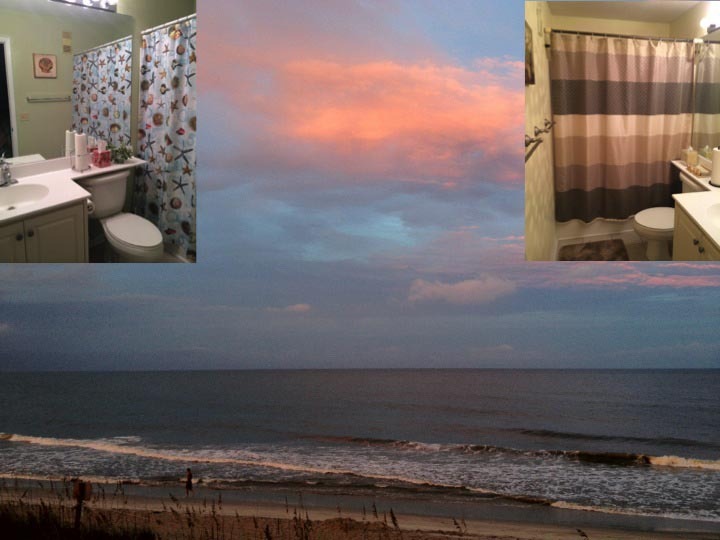 Indoor pool, hot tub, shower, locker, steam room (male/female) located at Ocean Dunes Clubhouse. 3 Outdoor pools (one very close to unit). 2 Shelters next to outdoor pools with tables and chairs. Tennis, basketball, shuffleboard, swing-set. Outdoor grills. THE BEACH!! Relax and do absolutely nothing! Was THE BEACH mentioned already? Weekly rental from Sunday to Sunday. No Smoking. No Pets. Wheelchair inaccessible. No elevator (unless uplifted by someone’s strong arms). Outdoor water resistant storage container on each deck contains an escape ladder to be mounted on railing for deployment (chair covers can be placed inside container to protect them from weather if needed). Do not feed birds (poop prevention); do not place towels over railings (unsightly). No Phone Service. Flooring is combination of tile, wood, and carpet. Fireplace for Esthetics Only (enjoy the remote controlled electric fireplace heater). Breaker box in hallway entrance (behind print on wall). Thank you very much for considering your vacation stay in our lovely beach home!! 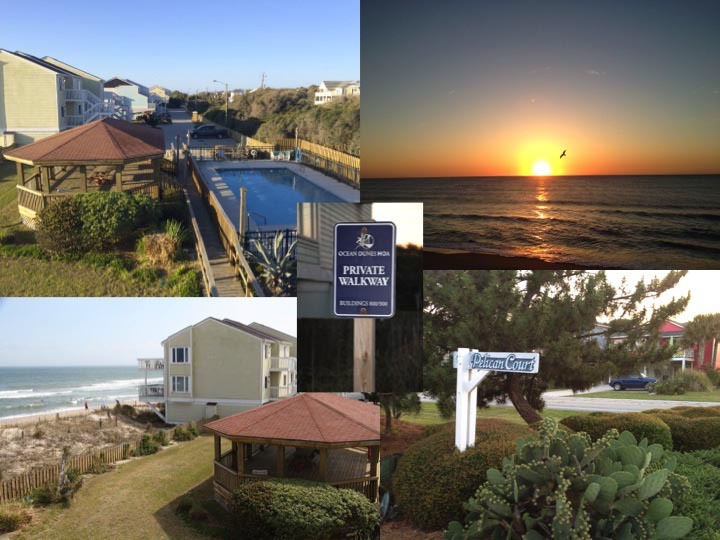 We stayed in Kure Beach for the Seafood Blues & Jazz Fest at Fort Fisher. Location was great! Condo was nicely furnished for 6 people. Unit was clean. I would recommend a blackout shade replace the blinds in the bedroom with the twin bed as the street light would shine in thru the blinds. I prefer rooms to be very dark when sleeping. Everything about the rental was described very accurately. Cleanliness and maintenance were all great, but the most outstanding thing about this rental is the location. 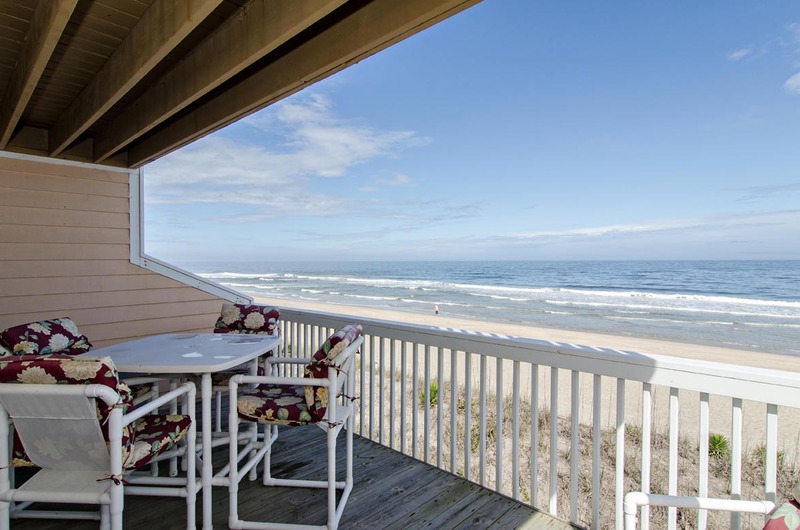 Ocean Dunes as a whole is a terrific complex and we've stayed in other units before but this one is right at the private beach access and allows you to not have to schlep your stuff very far at all. Pools are a little further but a quick walk nonetheless. Having a covered deck and an open deck is ideal. The decks are a little rough but the furniture on them is perfect. The unit is spacious enough to let people get away from each other when needed but also offers common space where we could gather as a group. Beds were relatively comfortable and closet space is plentiful. Nice beach chairs and other beach equipment were in the storage area if you want to pack light. We didn't reach out to Bryant for anything during our stay but they were great to deal with leading up to our visit. We would definitely rent with Bryant again and would definitely rent this outstanding unit again. Plenty of room for 7 of us. Great location. Unit is somewhat dated but was clean. Minor problems were addressed quickly by Bryant maintenance staff. I enjoyed my stay at The Rivera, the location was excellent, it had great views, and had everything that you would need. I would recommend however, that the property be deep cleaned. Five hours between guest check out and guest check is not really enough time to do all the cleaning that needs to be done. Upon arrival, we found a water bug that actually looked like a cockroach in the master bed, there were cheese crackers under the beds, and a meatball under the couch. Cleaners were sent immediately to take care of this, but it should have been properly cleaned before our arrival. The balcony door tracks were gross and the doors were hard to open. The laundry room was also in need of a good cleaning, as well as a bigger washer and dryer. Pots and pans in the kitchen also need to be updated and more comfortable mattresses would not hurt. Overall, it is a nice place and we enjoyed our stay, it just really needs to be deep cleaned and needs some TLC. First time visiting Kure Beach. The view and location is great. However the property needs to be updated. The brand new Apple TV had great picture quality but could not get the cable tv stations to come in. The walls were cracked and in need of paint. The condo next to ours was under going remodeling the trailer was permantely parked in front of our parking area and we came back from the beach to no water, then brown water. Construction smoke breaks made sitting in the deck unpleasant. There was also no storage room in the kitchen. Rachel thank you for your response. 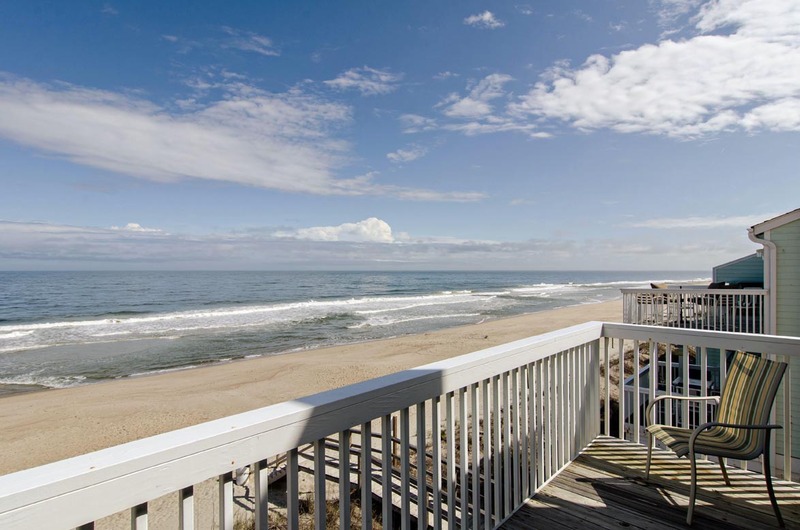 We are sorry that your first experience in Kure Beach wasn't fabulous, because it is such a beautiful area. 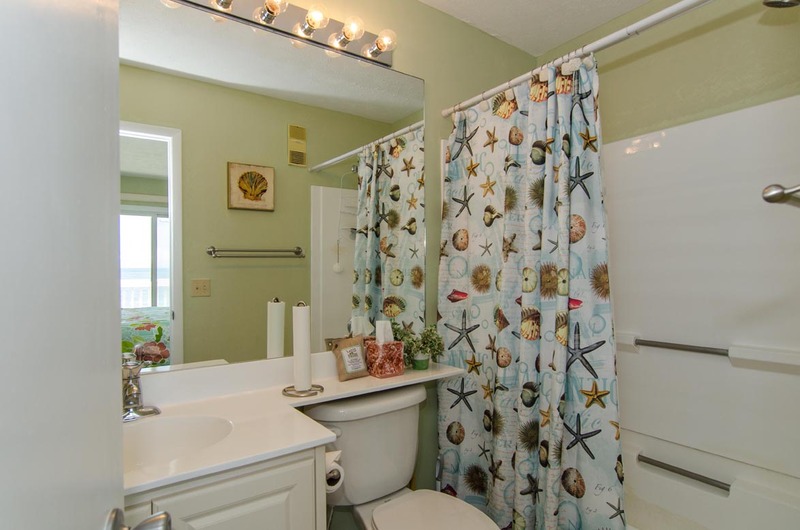 This owner takes great pride in his condo and will be respective to your review. Unfortunately we can not control construction work being done, but I understand how that would have been unpleasant. 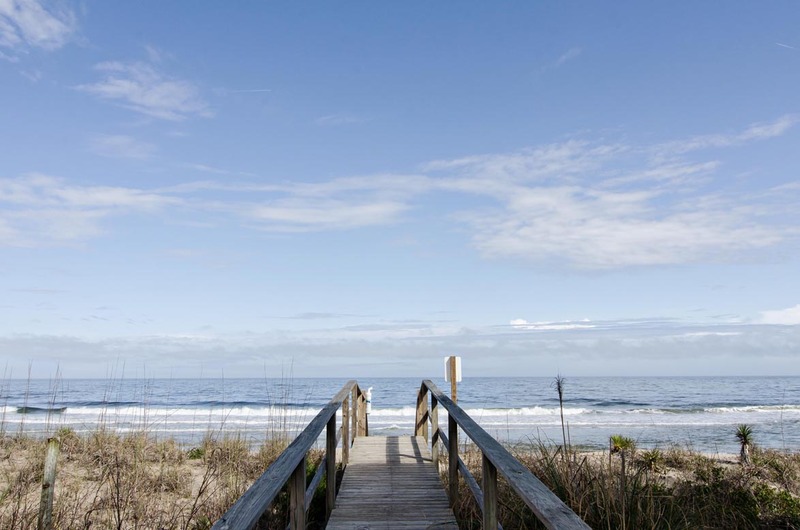 We hope that you will give Kure Beach another chance to experience just how great this area is. We had a wonderful time-great weather,restful,and we always enjoy our special time together. Great vacation. The rental was very nice and perfect for all are needs. It was well equipped with lots of extras. Will definitely look to rent again. Bryant RE is awesome! 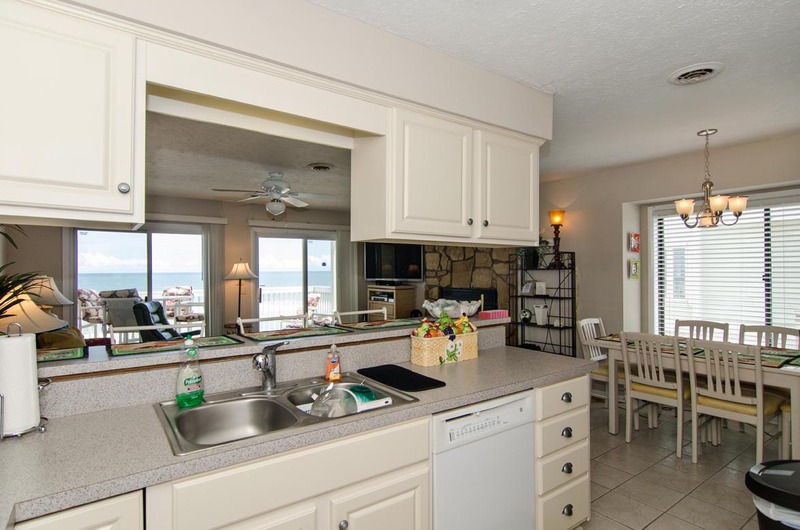 This townhouse is in a really great location if you are looking for a peaceful vacation. Right next door to walk way and on the end of the building. No public parking! The unit itself was clean and cozy. Master suite was lovely! Both balconies are in need of weather coating. A little rough. Furniture for balconies was great. Bring your own beach chairs etc. as things in closet in garage area were not in good condition. We left a chair we purchased. Kitchen was perfect, bar area a nice touch. Comfortable beds, furniture and great televisions (not that you'll use them much!) Sliding door to main balcony extremely hard to open! We got to the rental and there were issues. So cleaners were still there. House was clean and nice. We lost air conditioner over night was uncomfortable, called when opened and someone came out and the thermostat fell on floor so he had to go get another one. Fixed and left. Then we lost air conditioner again, someone came out and fixed it again. I am still recovering from bronchitis so breathing and lungs aren't fully healed, so it made it hard to breathe. Loved the view. Hi Judy- thank you for your feedback. I am so sorry for all the trouble your family had with the AC! That sounds very frustrating and uncomfortable. I am glad, however, that when we weren't able to fix it, our vendor was able to finally get the job done. We understand that it is not an ideal way to spend a vacation, but do hope that you were still able to have some fun. Thanks again- we hope to see you back at the beach again soon! a clean, well maintained property that is close to everything and has picture perfect Sunrises!!. Bill- Sounds like a great week at the beach!! Hope you'll visit again soon! 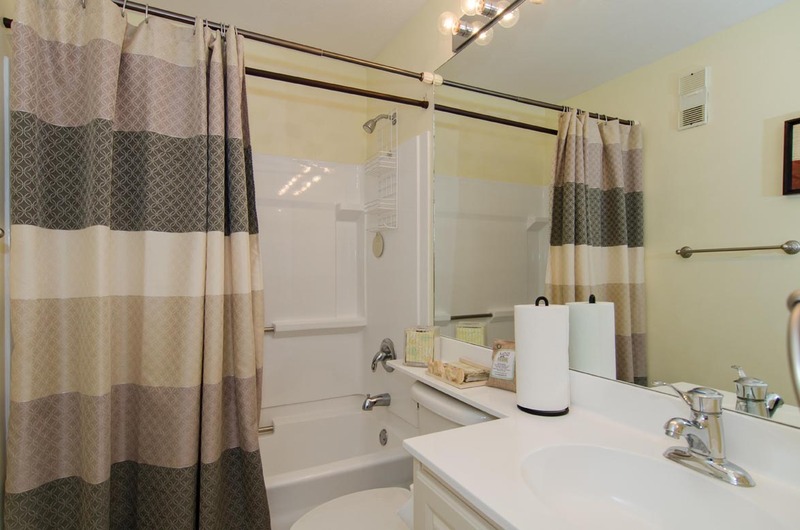 Lovely Townhouse in a great location! This was a lovely townhouse. The location was great. It was very neat, clean, and spacious enough for the 7 of us. We really enjoyed the proximity to the ocean and the pool. The indoor pool was a nice option, although the facility was very dated and not as clean as we would have liked. All in all we had a great vacation at this townhouse. Mary- Thank you for your feedback. We are happy to hear everyone enjoyed their week at the beach... hope you'll visit again soon! great vacation. very nice condo. Lu- Great to hear everyone enjoyed their time at the beach, hope you'll visit again soon! My whole family loved this condo. 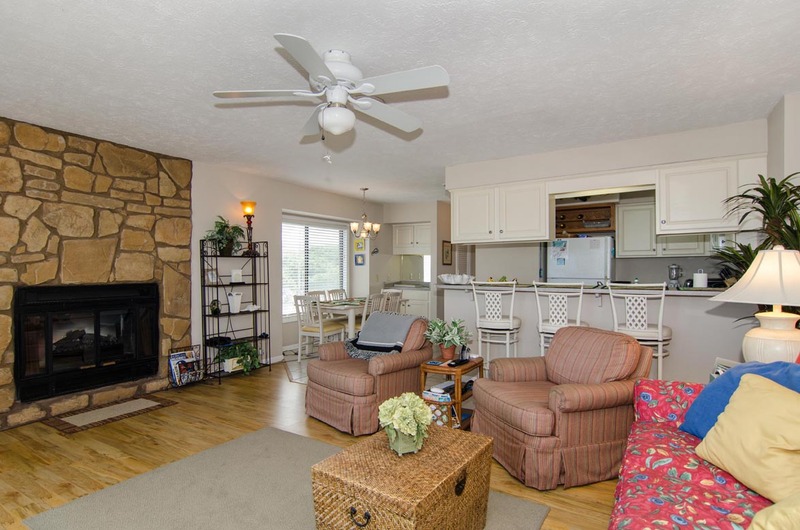 From the surprise gift on the counter when we arrived, to the view, to the spacious upstairs bedrooms, to the large TV's, etc., it is just a great condo for a vacation...actually, you could live in 's that good. And the two full sized balconies that are super close to the water...again, everything was just awesome about the unit!!! James- We are happy to hear your week at the beach was great! Hope you'll visit again soon! Wonderful property, decked out with all of the latest and greatest technology! You can tell the owners love their home and it was well stocked with everything anyone would possibly need during their stay! We loved how close we were to the beach (including the walkway to the beach). Bryant Real Estate was a great company to work with and were incredibly responsive to all of our needs! 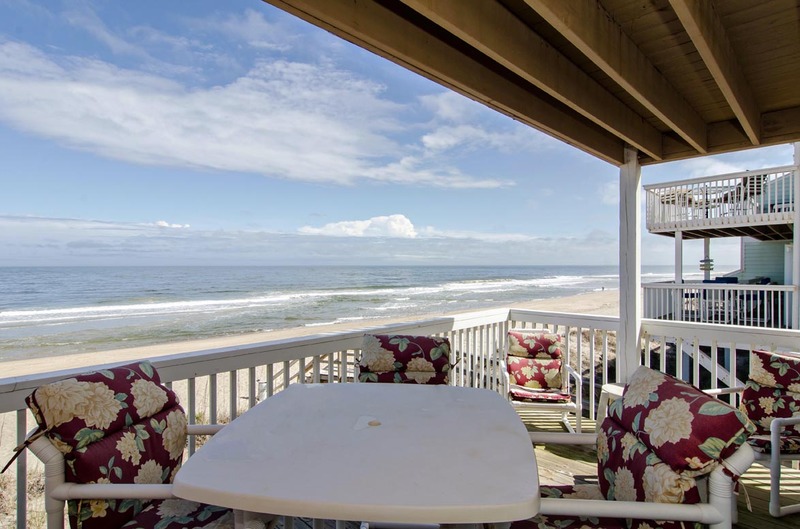 Would definitely recommend this property and we look forward to returning next summer! Melissa- We are glad to hear you enjoyed your stay! Look forward to seeing you again next year!! First the Bryant Real Estate were very helpful and accommodating. Each request was met with warmth and care. Thanks team. We had only minor complaints sliding doors needed to be sprayed and eventually repaired and a few missing bulbs and a few late night partiers who decided to risk the cold water. It's a new year so what the h... The home is used by the owners so the kitchen had good stock of things you need to cook with spices etc. The views of the beach were great and the day we were leaving 50 or more dolphins could be seen feeding right in front of our patio window. The weather for post xmas was great we had 5 days of 70 degree or warmer weather. Lots of hikes on the beach and collected over 100 sharks teeth during those hikes. My 15 and 18 year old had great time as well. 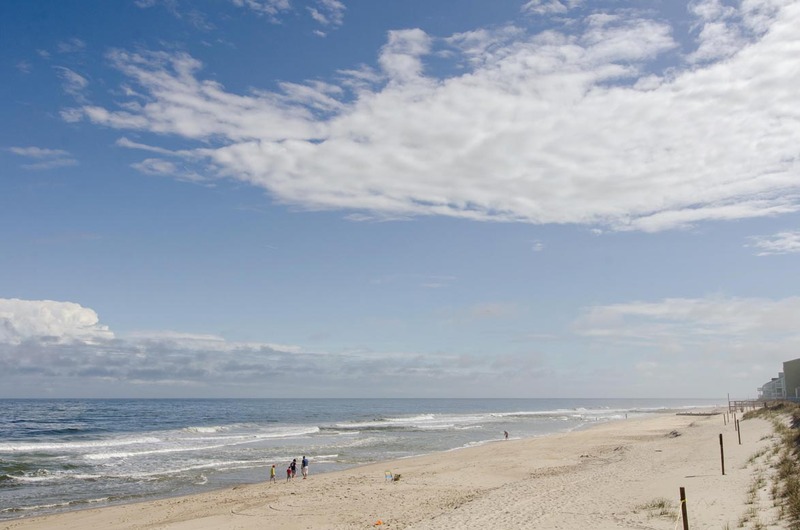 Kure Beach has been our beach destination for many years and we look forward to our next visit. good experience. We discovered one problem upon check-in, reported it to management, and it was repaired immediately.